Do you love the abundance of summer fruits as much as we do? They really must be our favorite fruits, from the berries to the melons and the stone fruit. Oh, the stone fruit! 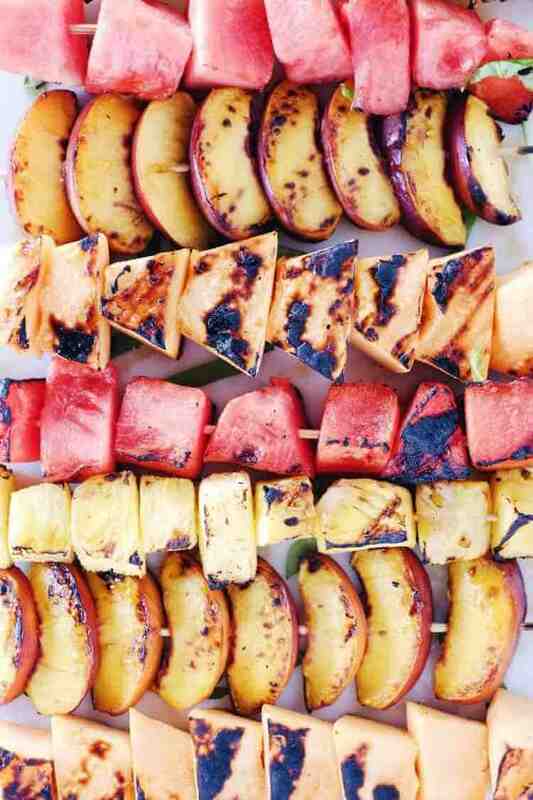 We enjoy eating them all kinds of ways, but these grilled fruit kabobs are a definite favorite this summer! Have you tried grilling your fruit yet? It is seriously so delicious, and food is better on a stick, so you might as well make them on kabobs. 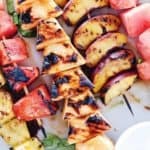 Plus, you can bring the most unique side dish to your cookouts this summer to by turning your kabobs into a delicious grilled fruit salad! We like to grill pineapple, stone fruit (especially peaches or nectarines), and watermelon. We also added cantaloupe to the mix this time around to take photos. It was all pretty great, but our favorites are definitely pineapple and peaches. If you have never tried grilling your fruit before, it is a must! We haven’t tried it yet, but I suspect grilled mango would be pretty delectable, too! Turn it up another notch, and add all of your grilled fruit to a large serving bowl, drizzle with balsamic vinegar, and top with freshly chopped basil. You will look like a pro at your next cookout or gathering! Seriously, try it, and let us know how amazed your friends and family are! 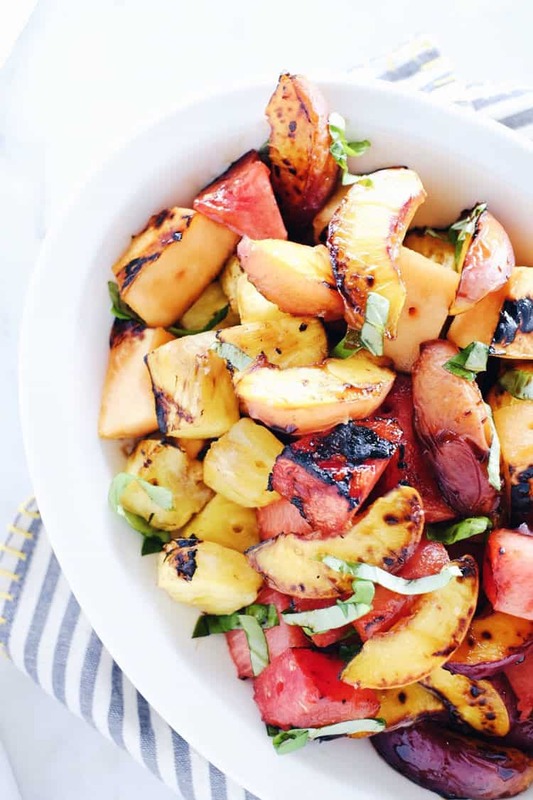 Get ready to knock the socks off of your family and friends, and make this grilled fruit salad! Let us know how it goes by leaving a comment below, and tag us on Instagram @realsimplegood so we can see! 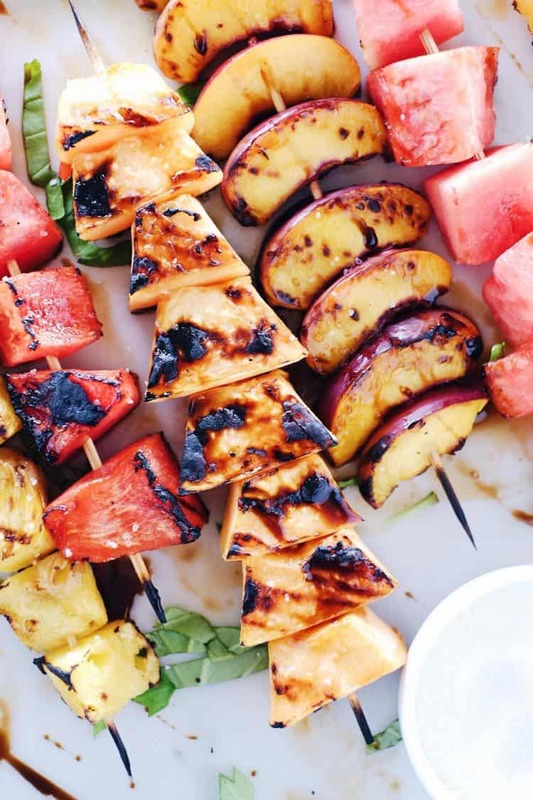 *You won't need the full watermelon, cantaloupe, or pineapple, but you can chop it all up and make the number of skewers that you need and then repurpose the rest of the fruit. We made eight skewers for the photos we took for this post, but often make less when it is just for the two of us, usually about two skewers per person. Fire up your grill, and let it get hot. Then, start by cutting up all of your fruit. You will not need the entire watermelon, cantaloupe, or pineapple. Either cut it all up and store the rest or cut up about half of everything. When we made eight skewers we used about a quarter watermelon and cantaloupe and about half of a pineapple. Load up your skewers with the cut up fruit. For the photos, we decided to do all the same fruit on each skewer, but you could mix it up and do a little of everything on each skewer or do it the way we did. Once your grill is ready, place the skewers on it. Grill for about 3-4 minutes on each side. You want the fruit to start to blacken and soften but not get too mushy. Remove from the grill once finished. To turn your kabobs into a salad, let the fruit cool, and then place it all in a large serving dish. Drizzle balsamic vinegar, and top your salad with chopped fresh basil. Sprinkle with a little salt if you dig a salty-sweet kind of concoction! Enjoy!